Very fast delivery and the battery seems fine. I've had Tayna batteries before and they have always been good and excellent value for money. Getting it pre-filled and ready to go is a real bonus, means you don't have to handle the acid yourself anymore. Bike starts beautifully again! Highly recommended product and seller. Very good price, prompt delivery. I didn't know this website before but I will use again. Many thanks. Very good quality battery. Quick and professional delivery. 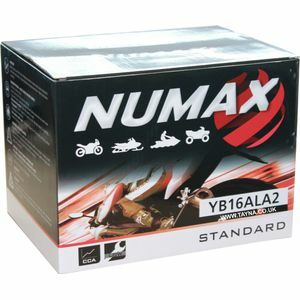 great product and customer service highly recomended .purchased two batteries one for my ducati the other for the wifes ducati.fast prompt delivery. The product was exactly as described and arrived the next data as expected. Big V twins play havoc with batteries, it takes a lot to kick one over, ver mind start it.... This battery has been good for a few years now, heading into its second winter, most don't last one. Perfectly packaged, easy to fill and fit. No problems. Fitted to a 1992 Ducati 400SS but should fit all early carburetter versions of the SS. Bought this for a 750 virago, and so far its performing spot on for a Battery that's half the price of some!